FOLEY, Alabama — When Doug Lipscomb settles in to catch Super Bowl XLIX, he won’t be focusing on the heroics of two top quarterbacks, the titanic tussles of burly linemen, or even the pyrotechnics of the halftime extravaganza. Nope, his mind will be on the turf. Super Bowl XLIX, which pits the Seattle Seahawks and the New England Patriots, isn’t the first big game for Bent Oak Farm, which specializes in turf for high-quality athletic fields. The firm supplied the turf for the last three Super Bowls played on natural grass, including the 2007 installment that was won by the Indianapolis Colts in a torrential downpour. Turf from Bent Oak Farms was rolled out for the Super Bowl field in early January. Bent Oak Farm’s hearty turf can also be found at the University of Alabama’s Bryant-Denny Stadium and Auburn University’s Jordan-Hare Stadium. The home fields of the NFL teams in Miami and Jacksonville also sport grass from the firm. So do the stadiums of Major League Baseball teams in Atlanta and Miami; in the spring, the Houston Astros will join the club. Lipscomb said he and partner Mark Paluch have worked to create the perfect grass for playing fields roamed by many of the nation’s most celebrated athletes. The turf – grown on a sheet of plastic, with very little soil – is extremely thick and dense, capable of handling NFL-caliber punishment. 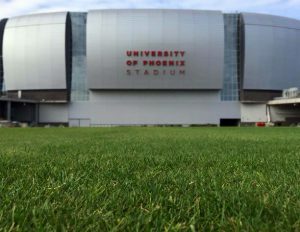 In early January, more than 30 refrigerated trucks loaded with Tifway-419 Bermuda Hybrid turf departed from Foley bound for the University of Phoenix’s one-of-a-kind football facility in Glendale, a city less than 10 miles from downtown Phoenix. The trucks, maintaining a temperature around 38 degrees, kept the Alabama turf cool on a trek stretching nearly 1,700 miles. Once the grass arrived at its destination, a team of workers laid the turf on a field adjacent to the stadium. The field was actually sitting on a 92,000-square-foot tray that can be transported in and out of the University of Phoenix Stadium using railroad tracks, making it the only retractable field in the United States. The Bent Oak Farm turf saw its first action in Arizona at the NFL Pro Bowl, the all-star game played in Glendale on Jan. 25. Only the grass in the end zones, which had been heavily painted, were switched out after that game. Lipscomb expects another good showing from the Bent Oak Farm turf in Super Bowl LXIX. “We’ve got a lot of confidence in our product,” he said.